I may or not be down with the kids but it’s rarely a film makes me go OMG! Yes, Oh My God… From da Oh to da My thru to d’G…! 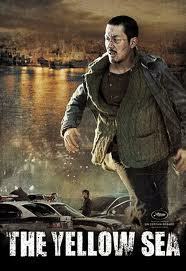 The Yellow Sea is one suspenseful, part-action, part-thriller (and one could even say, part-love-story) of a film. Somewhere between essentially South Korea and mainland China we meet a guy. 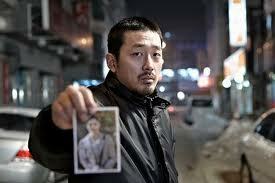 He, [Jung-Woo Ha] like many whom reside in this area is finding it hard to make a living. This guy has a day job, and a blood relation or two. The main focal point of his love-within has flown a while ago to South Korea, perhaps to never return. The guy who makes the aforementioned proposal is a dodgy character. But, when you’re down on your luck you’ll listen to all kinds of proposals. Whatever this character’s decision our story takes us to South Korea, ultimately Seoul and also Busan. In Korea, Jung-Woo Ha’s character must execute the proposal made to him. Execute is the perfect word here. It’s also handy as he can potentially meet up with his love. So, how to Exact an Execution and swiftly Exit accordingly… Hmmm… Well, this guy certainly knows how to observe, plan and stakeout as seen fit, to make this run smoothly. After all, he’s not committing any crime for free! Indeed not, and although he’s been promised a handful of digit-ed notes to undertake this, a couple of human digits, from a handful may also be acquired by him… Obviously… As proof that he’s performed a job well done. There is a great scene where he is judging the time a guy takes to get up to his apartment, using what he can see from outside. For example, the lights inside going on at certain times. But what does a guy do in between planning and carrying out a deed, in a city not too familiar to him? Well, he could go on the search for the love of his life. He could make enquiries to those in Seoul. When carrying out the intended deed things seem to be going well. Not much after this though, we have the perhaps corrupt and often inept police involved. Then? It gets rather involved regarding whom is chasing who. Talk about good guys, bad guys and gangs. You could say the story gets messy. The quantity of bodily fluids spilt definitely IS messy. If you don’t like sticky red vessel vino, then I wouldn’t watch this. The same goes for knives and the like – there are plenty on show here, slicing & splicing. Indeed, this is a very violent affair. It’s not without it’s humour though. It reminded me of “I Saw The Devil” a little, in it’s gore, unflinchingness and it’s who-has-the-upper-hand-now element [A review can be found here: I Saw The Devil]. 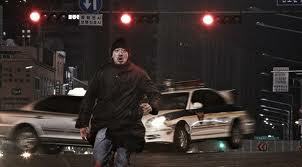 The few main characters will stop at nothing to achieve their goal, even if their accomplices are less willing. Although this could be a story of a man running, because he’s ‘on the run’ there is also even a pretty tense car chase thrown in. If you think that The Blues Brothers movie contained many a crashed car, you may want to rethink after seeing this. The film keeps you watching whilst not getting too predictable – Any predictability is quickly eclipsed by the latest run, attack or almost continuous violence. Yes. The Yellow Sea has elements of the Red stuff, The Blues Brothers & men with Black hearts.